A.J.P. Taylor once said that the best thing about growing old as a historian is that you find that you’ve increasingly lived through history. This was very much brought home to me while writing ‘The 1960s Look’. It all began with Sabrestorm Publishing asking me to write ‘The 1940s Look’. This seemed like a natural step after writing several other books on the subject of the home front in World War 2. Not having been born until 1950, the subject was one I could write about from a distance, carefully balancing the written sources, (accurate, but often very ‘dry’), with the memories of those who had been there, (colourful, but not always accurate – the memory plays tricks). This was followed two years later by ‘The 1950s Look’; I’d lived through that decade, but as a small child, and my memories of the decade were episodic and very subjective – of myself, my friends and my family – I even managed to squeeze in one of my primary school class photos. Yet even this tenuous familiarity with the period was of some use; whilst most fashion writing at the time was of haute couture, and described those who could afford to be on top of fashion, my experience, through older sisters, was of making do, and of up-dating old clothes through alterations. I was very keen to move on to ‘The 1960s look’; as I said to friends at the time; ‘”I was there”, and I have the photos to prove it; from the uniformed schoolboy through the crop-haired mod to the long-haired hippy. I thought it would be something of ‘a doddle’, yet I was unprepared for the problems of writing about a historical period through which I had lived. I thought the research would be straightforward, and to that extent I was right; the real problem I found was to keep a dispassionate stance on things. The sixties were my teens; a period when most of us approach life with a passion; things are either, (in the terms used then), totally ‘cool’ or completely ‘square’, and I soon found that my memories of the sixties were still deeply coloured by my views of the time. There was little that I did not have some personal recollection of. My teens coincided with the Beatles storming Britain, and I still recall the deep longing I had for a Beatle jacket, and the elation when my older sister Linda returned from a shopping trip in London with her own mock-leather (plastic) version, but with a black jersey one with a corduroy front for me. And not only that! The outfit was completed by a paisley shirt with a high tab-collar – heaven! I walked around the town displaying my new gear to discover lesson one; two cool girls from school who would not have given me a glance before now actually stopped and spoke to me in the street – I was hooked on fashion. Yet I was also about to experience lesson two; fashion’s transitory nature. Within a few weeks my fashion-icon clothes were becoming passé; now to look fashionable I needed a safari jacket, a paisley cravat, and hush-puppies. I had some old suede shoes which could scrape by, and my Mum ran me up a cravat from a piece of paisley material she had. But the cost of a safari jacket from the local ex-army shop was far beyond my meagre pocket-money; I tried to save up, but by the time I had enough, safari jackets were most certainly ‘past it’. My sister had convinced my Mum that I needed new clothes if I was not to be laughed at, so, with a bit from her and my savings, Linda took me shopping; she was a mod, so that meant I was to be a mod. It was the first time I had shopped for clothes without either of my parents, and I felt very grown up. We bought, I remember, two Fred Perrys, one red, one blue, and a pair of Levis; I had grown up in jeans, but they had been cheap and cheerful – these were the real thing, and every mod had to have a pair; no matter what the latest fashion, you could normally get by with a pair of Levis. Another unexpected effect of writing of times I had experienced was how music from the time, often almost forgotten, would suddenly come unbidden into my head as I was writing. So much so that I began to listen once again to the Who, the Animals, Dusty Springfield, ‘Little Stevie’ Wonder and many others. As with much nostalgia, it was often quite painful, but all-in-all it was an experience which I am glad I had. So will I do ‘The 1970s Look’? I very much doubt it. The other three books all looked back to times with distinctive styles; my memory of the seventies has little to do with style; platform shoes, loon pants, mullet hairstyles and kipper ties have little to do with style, as my wedding photos confirm. I feel that it is an age best forgotten – or maybe that’s just because I was there. 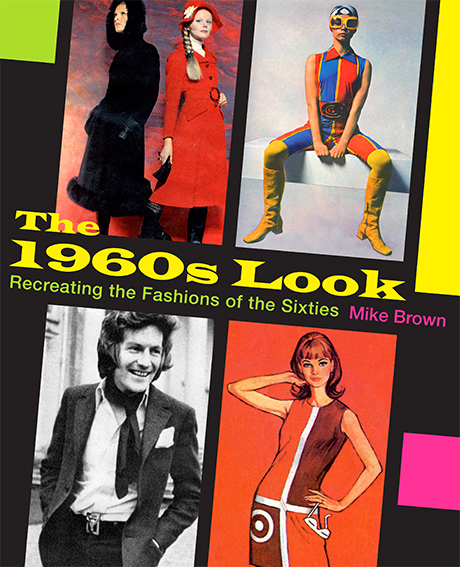 Mike Brown – Author of The 1960s Look.